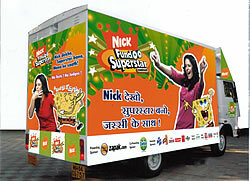 MUMBAI: Viacom kid‘s entertainment brand Nickelodeon and Mall of America have announced a partnership to set up the first-ever stand alone Nickelodeon theme park in United States by spring 2008. This initiative is also part of a re-branding initiative of the Mall‘s seven-acre amusement park. An official announcement states that the construction will begin after the architectural plans are complete. Though the majority of the creative elements are in development, including the official name of the new park, one of the first rides to be introduced in the park is a roller coaster based the animated Nick series, Avatar: The Last Airbender. Construction is expected to begin in 2007. Nickelodeon will also aim to establish its largest retail presence in the world at Mall of America, with a brand new Nick store occupying more than 4,000 square foot space, offering consumers items such as branded tee-shirts, souvenirs, novelties and more. The network will also introduce healthy dining options throughout the parks‘ eateries, in line with its four year old health and wellness pro-social initiative for kids and families, Let‘s Just Play. Throughout the design and creative process, Mall of America and Nickelodeon will conduct research and gain feedback on different concepts and designs by working with an advisory panel of kid experts to weigh in on key decisions and issues, adds the release. Nickelodeon Recreation senior vice president Howard Smith. "We‘re absolutely thrilled to expand our brand with our first stand alone Nickelodeon theme park and our largest retail presence in such a wonderful destination." As part of the partnership, Nickelodeon will bring its top characters, interactivity, and its signature iconic green slime to Mall of America. The newly revamped park, and the first ever Nickelodeon theme park, will feature new rides, live shows, retail, games and entertainment, and food service establishments themed with top ranking network properties including: SpongeBob SquarePants, Dora the Explorer, Go, Diego, Go!, Avatar: The Last Airbender, Danny Phantom, Jimmy Neutron: Boy Genius, The Backyardigans and many more. Costumed characters and live interactive entertainment from these Nickelodeon and Nick Jr. shows will also find a home at the Mall. Mall of America vice president business development Maureen Bausch. "We expect the newly themed park will draw even more new visitors from around the United States, as well as international travel markets."